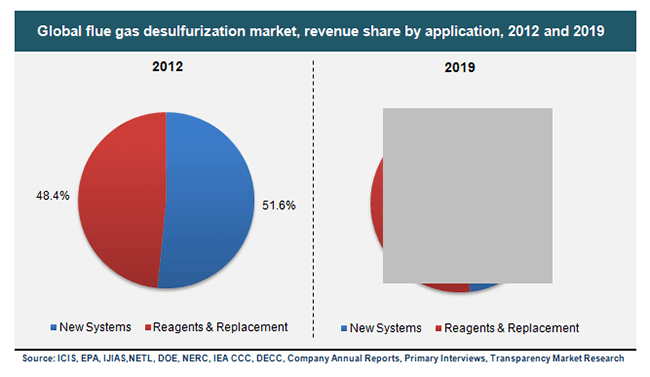 The report, titled “FGD Market for new FGD systems Reagents and Replacement Applications - Global Industry Analysis, Size, Share, Growth, Trends and Forecast, 2012 - 2019”, published by the market intelligence company Transparency Market Research presents an overview of the global flue gas desulfurization systems market. The report also includes historical data and a statistically refined forecast for all the market segments covered in the report. With the help of Porter’s five forces analysis, market attractive analysis, and value chain analysis, the report analyzes the overall competitive landscape of the global FGD market.The report states that the global flue gas desulfurization market had a valuation of US$14.9 bn in 2012. Projected to expand at a 5.80% CAGR between 2013 and 2019, the market is expected to rise to US$22.2 bn by 2019. Power plants that utilize a variety of fossil fuels release sulfur dioxide along with flue gas, causing harmful effects on the environment. Flue gas desulfurization systems are thus used to remove sulfur from flue gas and render it less harmful for the environment. The ever-expanding demand for power across the globe has led to a huge power generation market. With the rising consumption of a variety of fossil fuels in the rapidly expanding power industry, there has been an increased demand for flue gas desulfurization systems. Stringent government regulations in some regions have also mandated the use of flue gas desulfurization systems to make sure that the gases released into the air are not very harmful for the general population. Another major factor leading to the increased adoption of FGD systems is the need to replace worn out FGD components every year for smooth functioning of the overall system. The report segments the global FGD systems market on the basis of three criteria: application, technology, and geography. On the basis of application, the market is segmented into new flue gas desulfurization systems and reagents and replacement systems. Based on technology, the market is segmented into wet FGD systems and dry FGD systems. On the basis of geography, the market is segmented into North America, Asia Pacific, Europe, and the Rest of the World (Brazil, Africa, and the Middle East). Of the key applications of FGD system studied in the report, the segment of reagents and replacement holds the major share in the global market. Of the key FGD system technologies, the market segment of wet FGD systems had a clear dominance on the global market in 2012, when it acquired an 84% share in the market. This market segment is also expected to maintain its dominant position in the market over the report’s forecast period. In terms of geography, the Asia Pacific market dominated the global FGD market in 2012, accounting for a 54.38% share. Some of the key businesses operating in the market include Alstom, Marsulex Environmental Technologies (MET) Hamon RC, Siemens Energy, Thermax, Ducon Technologies, Babcock & Wilcox, and Mitsubishi Heavy Industries (MHI). Browse : Our new press releases https://www.transparencymarketresearch.com/pressrelease/flue-gas-desulfurization-systems-market.htm?